Is Smoking Shrooms Possible? Yes, But Should You? Smoking shrooms is similar to smoking a joint. Both activities require the same elements to prepare the object of inhalation—a piece of tobacco paper containing shrooms rolled up in a tube and glued on the side. They crush or grind them, often mix them with weed and put the mixture in a joint. Some people also smoke magic mushrooms along with ingesting them raw. Reportedly, a few users claim that this strategy increases the effects of the fungi, and helps them achieve the desired results. Psilocybe cubensis, as they are known in the world of science, are a “magic” fungi that grow in different parts of the world. Their first usage dates back nine thousand years when people ingested these plants for their psychedelic effects. Today, Magic Mushrooms can be eaten raw or dried, but they can also be rolled up into joint-like cigarettes and inhaled. In theory, a person can smoke shrooms, but the effect would not be nearly as intense as when they are consumed raw. In other words, absolutely nothing “magical” would happen if one were to inhale a shroom joint. The reason for this lies in the main psychedelic ingredient, psilocybin, which burns at 180 Celsius degrees. This means that if you heat the shroom at this temperature, you are practically killing the most potent ingredient that is responsible for the desired effect. On the other hand, some users claim they can smoke shrooms if the temperature is low enough, but the effect of the fungi is weak and does not last nearly as long as when consumed in its raw form. 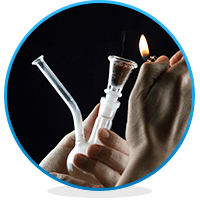 For this reason, most users believe that smoking magic mushrooms is a waste of time and money. The main issue with smoking shrooms is that the spores easily get stuck in the trachea and lungs when inhaled. Thus, causing insurmountable respiratory problems, such as inflammation, choking and other pulmonary risks that require lengthy medical treatment. As stated above, while smoking shrooms is an option, eating them raw is said to be the most effective way to achieve the best results. People who opt to smoke magic mushrooms often choose to add other ingredients such as marijuana or other substances that can enhance the effect of the shrooms. As exciting of a combination as this may sound, these mixtures, along with a few glasses of your favorite alcoholic beverage can potentially lead to “the best” or “the worst time of your life.” Mixing these unpredictable chemicals is a risky endeavor because one really knows for certain how these various substances will interact with one another. Subsequently, a “bad trip” can lead to aggression, uncontrolled violent behavior, and even suicide attempts. Can Smoking Shrooms Have Positive Effects? Contrary to popular belief, the rate of bad trips after eating or smoking shrooms is low. In fact, in a therapeutic environment after taking 1.6 grams of shrooms, nobody studied has experienced extreme fear or anxiety lasting over a minute. At this dosage it was also shown that shrooms had a positive effect on those taking the fungus, with 45% showing an improvement in mood. When that dosage was doubled, suddenly 14% of people experienced extreme fear and the length of anxiety was around 2 minutes. At 4.8 grams, there was a huge rise in people experiencing fear as the amount escalated to 86%. The period of anxiety was also extended to around 11 minutes. This highlights how much the dosage of shrooms can affect the type of trip you have. Maybe it is not always possible to take shrooms in a similarly therapeutic environment. However, there are shroom retreats, holidays essentially for those who wish to relax and enjoy the therapeutic effects of shrooms. These places are common in countries such as the Netherlands and Jamaica, where the laws on using shrooms are very lenient and relaxed. It is recommended that if you are going to take shrooms for the first time, or after an extended period of sobriety, that you begin with a low dosage. This will allow your body and mind to adjust to the psychedelic effects of shrooms. For the same reason, you should not begin a second trip until your body has recovered from the previous one. It is also recommended that you only take shrooms after you have been in a positive mindset for a few weeks. Mindset and mental health play a big part in the manner in which shrooms affect you and therefore your current mood, ideally, should be positive when going into the high. Many people who decide to take shrooms say that it is also helpful to have an experienced guide with them during their first few trips. This is usually someone who has experienced shrooms but is now sober and has time to guide you through the entire high, helping you avoid negative side effects. Finally, a very important part of avoiding the negative side effects of shrooms is preparing. Check that shrooms won’t interact negatively with any other medication you use or any health conditions you have. Make sure that the environment you are in is safe and tranquil and that your company is good. You should also have headphones and an eyeshade so that you can block out any potential hallucinations or excess noise that is inducing anxiety or fear. Even when you take every precaution, it is possible to have a bad trip. But if it does happen, what are the best ways to deal with it? Over 45% of people find that clearing their head and trying to think of positive experiences helps them through a bad trip. Thinking of good memories helps to block out fear and anxiety. Around 40% of people also found changing locations to be beneficial due to feeling safer. Alcohol or mixing shrooms with other drugs rarely works to guide you through a bad trip, with many people reporting it as worsening the effects of shrooms. Even though you may be experiencing anxiety and fear during a bad trip, it is still highly unlikely you will develop paranoia, so try to stay as calm as possible and not worry about things getting worse. Fear during a bad trip may not always be a bad thing. That fear will help you understand your limits with shrooms and it may even increase your wellbeing in the long term, due to giving you an element of perspective. All experiences during a shroom trip can be equally meaningful whether they are positive or negative. Shrooms have been proven to have many long-term benefits if taken correctly. People have shown greater self-confidence, decreased anxiety, increased tolerance and a generally happier outlook. Friends and family of the user also agree that they seemed much more content. In a study by Griffiths, 70% of participants rated long-term consumption of shrooms as one of their top five experiences in life. With over 30% of those participants, ranking it first. Shrooms have also been shown to help combat addiction. This is done by preventing the drug’s addictive effects from reaching the brain’s receptors, meaning people no longer crave the drug they are addicted to. The exceptional thing about this is that it seems to work with any drug, be it nicotine, alcohol or cocaine. This hasn’t been proven in all cases, however, psychedelics seem to be the most effective at managing this. Addiction Resource » Addictive Substances: The Anatomy of Drug Addiction » Shrooms – What are They? What are Their Side Effects? » Is Smoking Shrooms Possible? Yes, But Should You?